Have we fallen down? What is going on here? 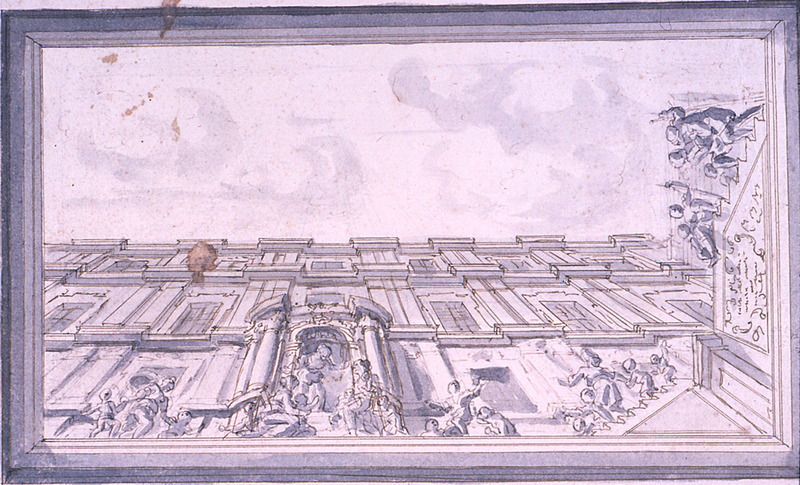 The perspective in this late 17th-century Italian drawing is so strange because it is meant to be viewed from below. This drawing was done in preparation for a painted ceiling, a frequent feature of the sumptuous palaces and grand churches built in Italy in the 16th-19th centuries. This type of illusionistic ceiling painting came from the ancient Roman wall painting tradition and developed in Venice in the 16th century. The subject and composition of this would-be ceiling are not typical of ceiling decoration. Italian painted ceilings often feature episodes from Roman and Greek myths or from the Bible, for example the scenes of mythological lovers at the Palazzo Farnese or the scenes from the Old Testament in the Sistine Chapel. The settings tend to be pastoral or paradisiacal. This drawing, by contrast, focuses on architecture and depicts contemporary life unfolding in front of a three-story Renaissance palace. A woman stands in the doorway and mothers bring their children to her. On the right side a group of men ascend stairs, the side of which are covered with an illegible inscription. A cloudy sky comprises the rest of the pictorial space, which is asymmetrical; most painted ceilings are more evenly balanced, with the figures or decorative motifs placed consistently about the space. A careful look above the palace reveals lightly drawn lines that extend from the palace’s columns into the sky. These lines converge at a point in the sky. The artist drew them to help create linear perspective in the design. The small size of the drawing and its lack of color indicate that it was created early in the design process. Later on it would have been followed by colored sketches and studies in oil paint. Juergen Schulz, Venetian Painted Ceilings of the Renaissance (Berkeley: UC Press, 1968), vii. Vianna Newman is a Peter A. Krueger Intern in the Department of Drawings, Prints, and Graphic Design. She has a B.A. in Rome and the Renaissance and Italian from Indiana University.